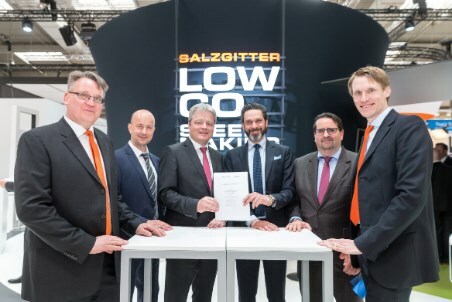 A concrete step towards future-oriented, climate-friendly technology for steel production: Tenova – a company of the Techint Group specialised in innovative solutions for the metals and mining industries – and Salzgitter AG – among the leaders in innovative and sustainable steel and technology products – declared officially a mutual co-operation for the realisation of SALCOS (SAlzgitter Low CO2 Steelmaking) by signing a Memorandum of Understanding (MoU) on 2 April in the context of Hannover Messe 2019. SALCOS is a revolutionary concept for a significantly CO2-reduced steel production, commonly developed by the two companies. The aim is to undergo a stepwise transformation process of the integrated steel making route, moving from carbon-intensive steel production based on Blast-Furnaces towards a Direct Reduction and Electric Arc Furnace route, including the flexible incremental utilisation of hydrogen. This concept is capable of reducing CO2 emissions up to 95% with respect to the entire steel production route. The co-operation aims at jointly applying for public funding of the SALCOS project.